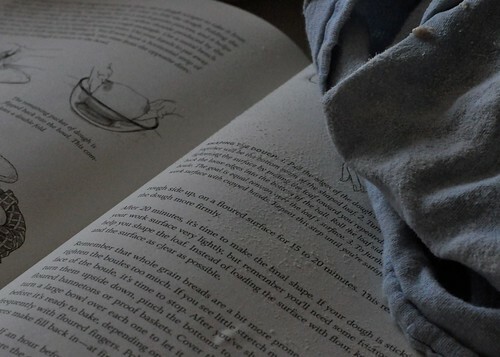 Not snow, but flurries of flour settle on the tea kettle, cutting boards, potholders, tea towels, cookbooks, floor, apron and nose. 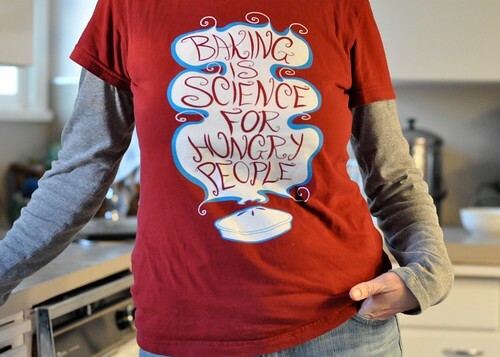 My dad gave his children sourdough starter at Christmas and launched a storm of baking that’s covered half the country. From the edge of the Pacific Ocean to the edge of the Appalachians, we’ve been stirring up clouds of wheat and spelt and barley as we strive for bread nirvana. But wild yeast is a temperamental creature, unpredictable in its reaction to the flour it’s fed and the environment it lives in, which can cause the resulting loaves to be (by some standards) a little too dense and chewy. But that flavor! Ahh, the flavor. Subtle, tangy, substantial. Break the crust, study the uneven air pockets, smell the toasty sourness, place a piece in your mouth, turn it around with your tongue, and wonder how it’s possible that poetry is edible. In the past few weeks, I’ve done a lot of experimenting. A lot. I’ve started loaves of bread at 10 o’clock at night to allow for a long, slow rise, and my dutch oven is rusting from the amount of no-knead loaves I’ve baked in it. All this tinkering — with flour, with recipe, with heat — has resulted in tasty, but not wonderful, slices of bread. Still, I persist. But in my determination for that well-crafted loaf — or line of poetry — I pause to share this recipe because it’s a keeper. 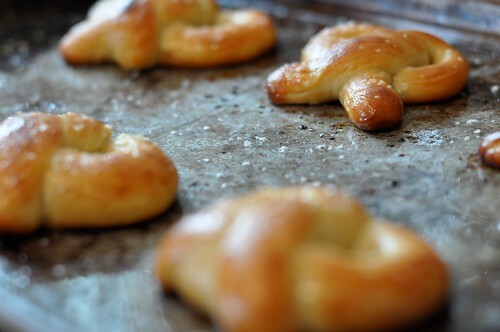 These soft, tangy, chewy pretzels are swift (thanks to the use of instant yeast), simple (just one rising! ), satisfying. Given sourdough’s mercurial character, it’s not easy to achieve all three, but it can be done. Mix and knead the dough ingredients by hand, mixer or bread machine, to make a smooth, slightly sticky dough. Cover the dough and let it rest for 45 minutes. It will rise a little. Toward the end of the rising time, preheat the oven to 350 F. Put the dough onto a lightly floured surface, fold it over a few times to deflate it, then divide it into 12 pieces, each weighing about 2 1/4 ounces. Roll each piece of dough into an 18-inch rope and shape it into a pretzel. Dissolve the sugar in water and brush the solution on the pretzels and lightly sprinkle with salt. 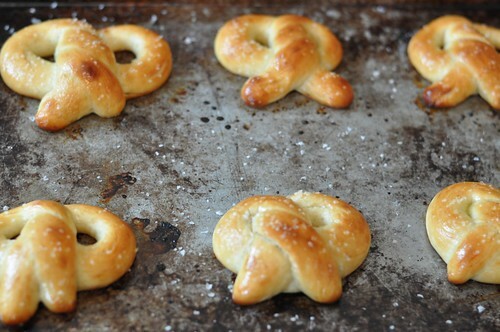 Bake the pretzels for 25 to 30 minutes or until they’re a light golden brown. 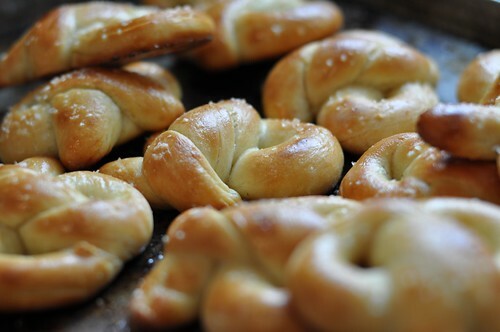 (You don’t need to let the shaped pretzels rise before baking.) Remove the pretzels from the oven and brush with melted butter. Oh, YUM. These look scrumptious. Between your pretzels and Orangette’s recipe for salty chocolate cookies today, gosh, how’s a person supposed to settle down and work? My dad made GREAT no-knead bread. He tinkered with the recipe until he got it just right and there was nothing better than carving into that crisp, yeasty loaf and slathering it with butter. Thank you for this. Poetry indeed! Now I know what my daughter and I are going to make this weekend. These look so good. I know nothing about sourdough starter. Perhaps this will be a new project. But for now I’d like a few of your pretzels and a slice of Christina’s dad’s bread.